The 6 March 2008 issue of the New York Review of Books includes a magnificent demolition job in a review of the memoirs of that rascal of the far right, John Bolton, by the veteran retired international public servant, Sir Brian Urquhart. (Hat-tip: to Dr Lorna Lloyd at Keele, who alerted me to this review in the NYRB.) Earlier this year, Sir Brian recorded an interview lasting nearly an hour for a University of California at Berkeley series of Conversations on International Affairs, all eight parts of which are available on the Berkeley website. Both the book review and the extended interview are compulsory reading and viewing. You would never guess from the vigour and forthrightness of both that Brian Urquhart will be 90 next year (2009). Urquhart is well-known for his attempts to persuade the planners of Operation Market Garden to modify or abort their plans, in light of crucial information obtained from aerial reconnaissance and the Dutch resistance. The episode was described by Cornelius Ryan in his book on “Market Garden”, A Bridge Too Far. In the film version, directed by Richard Attenborough, Urquhart’s character was renamed “Major Fuller”, to avoid confusion with a similarly named British General. Urquhart was a member of the staff involved in the setting-up of the United Nations in 1945, and has advised every Secretary-General of the United Nations since its inception. His main fields of interest and operation at the UN have been conflict resolution and peacekeeping. Urquhart organized the first peacekeeping force (in Egypt after the Suez crisis). To differentiate the peacekeepers from other soldiers, the UN wanted to have the soldiers wear blue berets. When that turned out to take six weeks to make, Urquhart proposed the characteristic blue helmets, which could be made in a day by painting over regular ones. As Undersecretary-General, Urquhart’s main functions were the direction of peace-keeping forces in the Middle East and Cyprus, and negotiations in these two areas; amongst others, his contributions also included work on the negotiations relating to a Namibia peace settlement, negotiations in Kashmir, Lebanon and work on peaceful uses for nuclear energy. Sir Brian has written several books, including brilliant biographies of Dag Hammarskjöld and Ralph Bunche. He has also written an autobiography, A Life in Peace and War, published by W.W. Norton and Company. His books on decolonization, and more recently on reforming the United Nations system, have projected him into the international limelight of transnational politics. 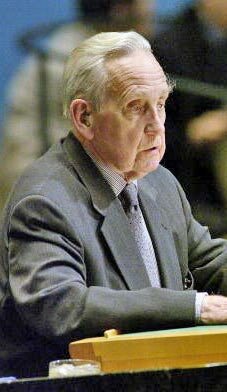 A tireless speaker and activist, Sir Brian [was] deeply involved in the events surrounding the fiftieth UN anniversary. His pieces on the UN volunteer force and the responsibilities of the UN system published in The New York Review of Books in 1993 and 1994 have set the terms of the debate for all future discussions of rethinking the UN system. Knighted in 1986, Sir Brian has another, rarer distinction: his portrait, by Philip Pearlstein, hangs in the National Portrait Gallery (room 35). During my time in the late 1970s and early 80s as head of a Foreign & Commonwealth Office department, heavily engaged for several years in the seemingly endless and tortuous negotiations leading eventually to the independence of Namibia under processes arising directly from a UN Security Council resolution, I periodically had some contacts with Brian Urquhart, then UN Under-Secretary-General and one of the two or three most senior members of the UN secretariat. He was, and no doubt still is, an extraordinarily good listener, ready to consider seriously any ideas and proposals emanating from any quarter without regard to its rank in the hierarchy. He was incredibly flexible and innovative, not the qualities most commonly found (in those days, anyway) in UN secretariat officials. He was strikingly courteous, calm and patient. If he had any defects as an international diplomat, you’d have had a job picking them out. Well, the thing went very seriously wrong and I then realized what I hadn’t realized before, that these generals and great commanders and politicians who were so admired during the war were actually just like everyone else. They were vain, they were ambitious, they very often made extremely faulty judgments. I had not thought of that before; I had always thought that they were kind of super-people and I must say that the feeling has remained with me for the rest of my life. I never again trusted famous, glamorous leaders to resist vanity and ambition and make the right, mature decision, and get it right. Recent British and American history alas provides ample confirmation of the rightness of that penetrating conclusion. Historians may not always give enough weight to the role of glamour, vanity and ambition on the part of political and military leaders in driving them on to fatal misjudgements and consequent disasters. British people should be proud of Sir Brian Urquhart: those who know about him undoubtedly are. It’s a pity that he isn’t more widely known and his exceptional record more widely appreciated, although he’s not the kind of person who seeks or would enjoy celebrity status. It’s not perhaps too late for a Nobel Peace Prize, which would make him better known. That would be one in the eye for the appalling John Bolton, although several decades too late for the Arnhem generals. In the mid 1960s I was commissioned by Alastair Buchan, Director of the Institute for Strategic Studies (as it then was), to write a book on peacekeeping. He and Brian Urquhart were friends, which doubtless helped with introductions when I travelled to the Middle East and Cyprus to see the sort of thing on which the UN was engaged. I also visited North America and there met Brian, he being Under Secretary-General for Special Political Affairs in the UN Secretariat, responsible for special assignments and negotiations and much else. As I maintained my interest in peacekeeping, this was followed over the years by many other meetings. Most of those which took place prior to his retirement were when he was Under Secretary-General for Special Political Affairs, but despite his considerable responsibilities he was invariably ready to see me. Even more valuable – and remarkable – was the fact that he was always exceedingly helpful. He would comment in an acute, frank, unstuffy, and often amusing way on my questions, put me in touch with others who could help, and smooth my way on visits to UN peacekeeping operations. I could not have asked for more. I might just underline your point that his books and articles are no run-of-the-mill memoirs and analyses. When in 1987 I presented him for an honorary degree, I referred to him not just as a ‘soldier and very distinguished servant of the UN’, but also as a ‘scholar’ – a standing he had achieved alongside his work as an international official. Since I put this post on the blog, I have received a very appreciative and friendly letter from Sir Brian Urquhart, who now divides his time between Western Massachusetts and New York. Sir Brian helpfully pointed out an inaccuracy in the description of his formal role in the UN Secretariat when Professor Alan James was in touch with him in the 1960s and later (as described in the Update), and also suggested an expansion of the account of his recommendations prior to the Arnhem Landings operation, both of which are now incorporated in the text above. Brian Barder, I am writing to say that you performed a true public service through this excellent brief appreciation of the life and work of Sir Brian Urquhart. I am no less than eight years late in saying so; but it seems worth saying all the same. I believe that one of the least-understood evils of our age, subtle but intensely corrosive, is the tendency in the media to dramatize what is pathological and destructive, and ignore what is constructive, positive, and humane — but is not, on a narrowly commercial definition, news. Here is a man who, though a life of patient, intelligent and dedicated public service — enlivened by initiative, daring and humour — has made huge contributions to peace and human well-being…. and it is truly dismaying to find how few know about it. I’m aware of it because of wide-ranging international business interests, and a long-standing outsider’s interest in the work of the UN. Of course, it is always impossible to definitively answer questions like “what would have happened if Urquhart and his colleagues had not provided, in 1956, a practical way to stabilize the Israeli / Egyptian conflict?”; “what would have happened if Urquhart and his colleagues had not struggled, after 1961, to stabilize the Congo”; or “if the independence of Namibia from South African rule had not been managed so successfully, would the subsequent transition away from Apartheid in South Africa have gone as smoothly as it did? But there’s no doubt in my mind that without the efforts of Brian Urquhart, as well as his equally little-known predecessor Ralph Bunche, and his successor Marrack Goulding, the world would be a much worse place even than it is today. Brian writes: Thank you for this. Ralph Bunche and Brian Urquhart were well known when they were actually working in the top ranks of the UN Secretariat and when UN peace-keeping, which they were successively (and successfully) in charge of, was always in the news. But alas, that was a good many years ago and I suspect that their names are indeed now largely forgotten except by readers of the New York Review of Books for which Sir Brian (Urquhart, not Barder!) still writes regularly. I didn’t know Ralph Bunche but I did know Sir B Urquhart a bit from the complex and difficult Namibia independence negotiations and regarded him from the start as a truly great man. One brief addendum to my post about Sir Brian Urquhart. Thank God for the UK honors system, odd anachronism as it may be. It has provided just recognition to several outstanding careers in international public service — another deserving example that springs to mind is Dame Joan Anstee. Brian writes: Thank you for this. I agree that national honours for outstanding international public servants such as Sir B Urquhart and Dame Joan Anstee after their retirement are richly deserved, especially since few such people achieve wide public recognition during their active careers. But a national honour for people like this while they are still working for an international organisation such as the UN would risk being an embarrassment, for obvious reasons.